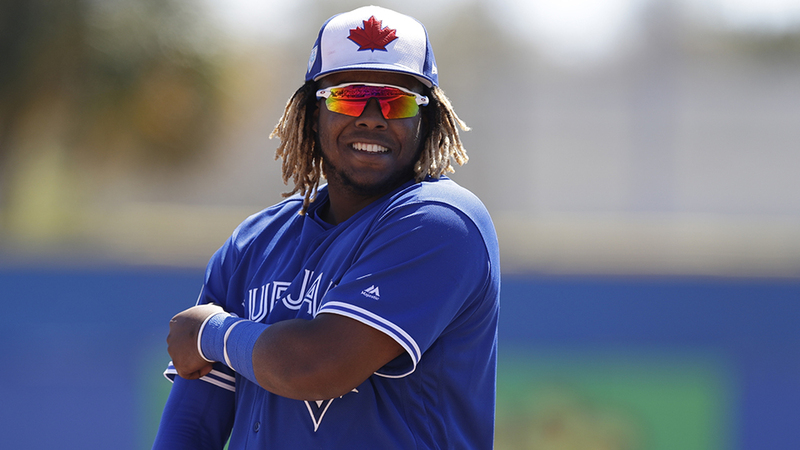 Savor each hit from Vladimir Guerrero Jr. because they could be among his last in the Minor Leagues. MLB.com's top overall prospect smacked three singles in five at-bats on Sunday, driving in one run and scoring another, in Triple-A Buffalo's 9-5 loss to Scranton Wilkes-Barre at PNC Field. Guerrero's first three-hit game of the year raised his average to .500 since joining the Bisons from a four-game rehab stint in the Florida State League. And it comes just days after Blue Jays manager Charlie Montoyo said there's no reason a "hot" Guerrero shouldn't be playing his games at Toronto's Rogers Centre. Guerrero's first three at-bats came against Gio Gonzalez, who's logged 1,814 innings over 11 Major League seasons. In the first matchup, the top Jays prospect turned the left-hander's 0-2 offering into a single to center field. The first pitch of the third inning produced the same result. Gonzalez won the third encounter when Guerrero grounded into a double play, but that didn't do much to alter his assessment of the 20-year-old phenom. "He needs to get out of here [Triple-A] already," Gonzalez told the Scranton Times Tribune's Conor Foley. "He needs to go up there. I think just -- he's done his time. He's way overdue. He needs to get up there already, I think." Guerrero made as much clear when he posted a .381/.437/.636 slash line in 2018. During his rapid rise to the International League last year, the third baseman hit .402 in 234 at-bats with Double-A New Hampshire, blasted 20 homers and 20 doubles across four Minor League levels and struck out 38 times while drawing 37 walks. All that might have been enough for him to make his Major League debut by now, but his timeline shifted when he strained his left oblique on March 10. In Buffalo, Guerrero joined a number of top Blue Jays prospects who might not be far behind in the pipeline. Second-ranked Bo Bichette drilled his first Triple-A homer on Saturday. Cavan Biggio and Anthony Alford -- ranked 10th and 11th in the Jays system, respectively -- follow Guerrero in the middle of the lineup. Biggio went 2-for-3 with a walk on Sunday to raise his OPS to 1.167. RailRiders first baseman Mike Ford outshined them all with a pair of homers, a double and three RBIs. Ryan McBroom and Kellin Deglan went yard in the fourth, and that was enough for Gonzalez (2-1), who gave up two runs on eight hits and two walks with eight strikeouts in five innings. Bisons starter David Paulino (0-1) took the loss, allowing five runs on seven hits and a walk in 3 2/3 innings. He fanned five.